It's being described as a travesty as vicious as the demolition of the Jai Alai Building! We just lost the Meralco Head Office in San Marcelino, Manila, an Art Deco gem designed by Architect Juan Arellano in 1936. Its facade has relief sculptures by Francesco Ricardo Monti. The Arellano-Monti collaboration makes the building even more significant. 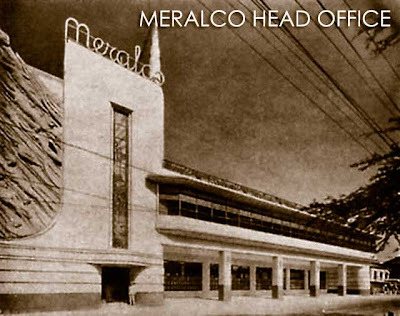 According to Architect Paulo Alcazaren, the Meralco Head Office is "one of the key urban edifices in burgeoning Manila, the headquarters of the power and transportation company Meralco (Manila Electric Rail and Light Company). It was one of the most modern commercial buildings in Manila before the war and was designed in the Art Deco-streamline style. It had the country’s first air-conditioned office spaces (Carrier). 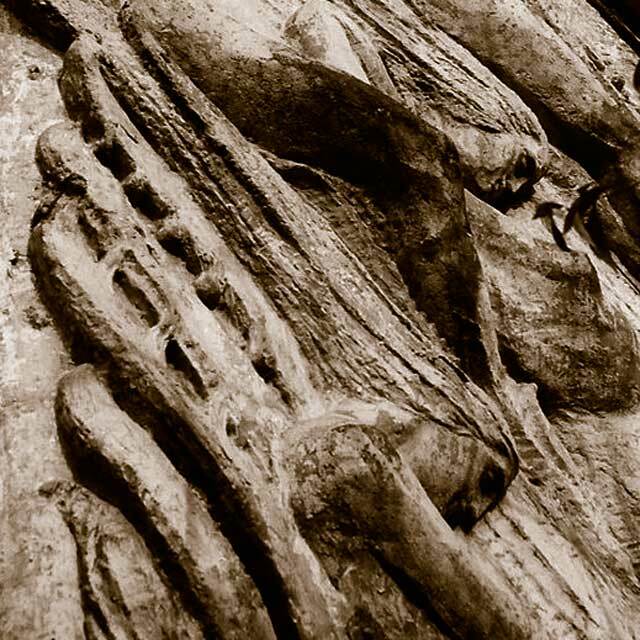 The building’s most distinctive feature was a tall (four-story) sculptural relief by Francesco Monti." On the Monti work, Architect Manolo Noche notes, "More than any other works by Monti, the 'Furies' is his one big commissioned bas relief that is not religious in nature. This should be declared a national work of art. If lost this is tantamount to artistic murder." What saddens me even more is our helpless response to try to stop the demolition. It's about time we come up with a list of owners of recently demolished works of National Artists and renowned architects. It's really frustrating! Alcazaren asks, "Why lose another heritage building? Why don't people see the value in conserving layers of history?" He adds, "[layers] without which we will eventually lose all ties to the past, all hope of a foundation for an urban future, a future that now seems destined to create placeless cites, soul-less buildings, devoid of history, culture or sense of identity, save those imposed by the gods of profit." The fact that it is happening now, with RA No. 10066 - National Cultural Heritage Act of 2009 in place, is totally unacceptable. Maybe our legislators, especially the sponsors of the law, should start asking for answers. Have they given more teeth to an agency that doesn't seem to know how (or want) to use it? We need answers fast! The NCCA needs to file cases now! Update (02/07/2012): Now that the dust has settled on the Meralco Head Office demolition and information is now more complete & clear, I realized that architects have a large responsibility in the preservation of our heritage sites. When the owner found out about the value of the structure, they stopped the demolition. I hope the United Architects of the Philippines (UAP) plays a significant role in the dissemination of RA10066 among its members. If there's anyone who should have understood the value of the structure, it's the architects. While they may not have had anything to do with demolition, they should have informed the owners immediately that there was a heritage building on their property. G&W Architects could have proposed an adaptive reuse of the Meralco Building as facade or entrance portal of the 30-floor all-glass building they were planning to build. At least the building would have had character. As Dom Galicia points out, "There seemed to be no guidance from their architects regarding the value of Juan Arellano. The owners have stopped the demolition and Paulo Alcazaren is now going to try to convince them to recreate a replica of the facade, and to preserve remnants of the tranvia barn tracks." Since it is not part of the competencies of the Manila City Engineer and his staff to know what is a heritage building or not (engineers have no training for that I would believe), we are now coordinating with the Institute of Philippine Culture (IPC) of the Ateneo de Manila University, which has been conducting comprehensive and intensive surveys and research on the built heritage of Metro Manila (NCR), to provide the LGU with that list. Too bad it's taking our government institutions so long to come up with a registry. Good thing the private sector is doing its share! very unfortunate that it happened this way. unfortunate talaga. That's so sad. Ivan, was the bas relief saved at least? who is accountable for this? Isn't it that before demolitions can be done permits are secured? grabe naman! how negligent are the people in chatge of this. Ivan...can't we do anything about this? it's not as if this is the first time this happened. Monti work is still there. We're doing what we can. Hopefully those who can do something about it start moving. Saddens me that heritage buildings go to waste one by one ... How can ordinary people help preserve these historic architectures? This is very sad. The Jai Alai building and now this? Isn't the Paco Train station being torn down too? Such an unfortunate fate for us as a people and nation when we cannot defend and preserve vestiges of our rich historical heritage for the benefit of future generations. No wonder we lack a sense of national identity and we have this chip on our shoulder when it comes to matters of national self-esteem because instead of celebrating the beauty and elegance of our country's soul through our culture we instead find ourselves prostrating in front of the gods of commercialism. It wouldn't have been destroyed had the building been kept clean and usefull. Too bad. if students of architecture are not exposed to the magnificence- as well as the plight of these and other vanishing jewels of Philippine architecture and only hear paeans about how great the generic edifices of glass and steel are, then how can they, once architects, be expected to place any value on heritage? If these beautiful pieces of art are looked upon as archaic, not “LEEDS”-worthy, unproductive, or worse, nuisances, that must give way to cloned “masterpieces” of western counterparts, then we might as well bid heritage good-bye. Architects are the first line of defense in the preservation/ constructive re-use/ adaptation of these works of art. How many can see beyond their egos, laziness or the temptation of money? Have we become a throw-away society, eager only for the next best thing? Or, are we so poverty-stricken that we see heritage solely as opportunities to make a quick buck? Sell the damn things to the highest bidder-developers to tear down and build their gleaming high-rises on. Then we might eventually have alzheimer’s on a national scale. Also e-mail Mayor Lim's COS at cos_ricdeguzman@yahoo.com & remind Manila City Hall of their responsibility to take care of our heritage! 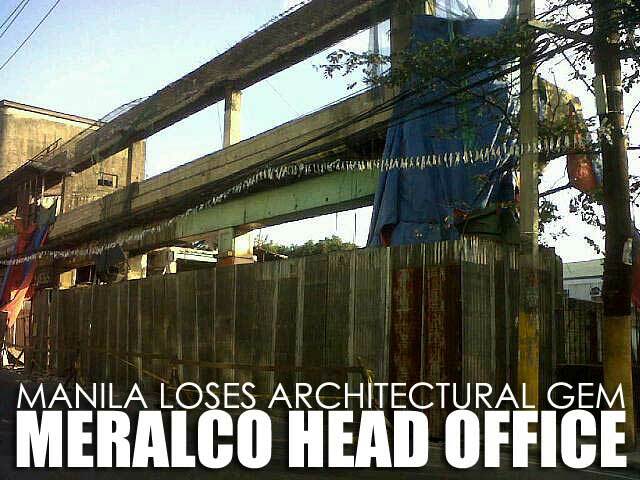 It is with sadness that I read about the on-going demolition of the Meralco Building in San Marcelino. This building is an architectural gem, part of Manila's heritage. I cannot understand how the City of Manila can allow this art-deco building designed by Juan Arellano with a valuable sculptural work by Franciso Monti to be demolished. Aren't permits for demolition secured before they can be done? Does the one in charge of giving the permit for demolition know the value of this building. Manila was a beautiful city, I was born there and loved our summer visits. This building among the few left was part of that memory. How I wish that Manila would preserve whatever little heritage is left. Mayor, you have always loved Manila...I respectfully appeal to you to protect its heritage. Thank you. A number of significant edifices that was a part of national historic identity of manila had been either, trashed, abandoned or not, been demolished and literally torn down. 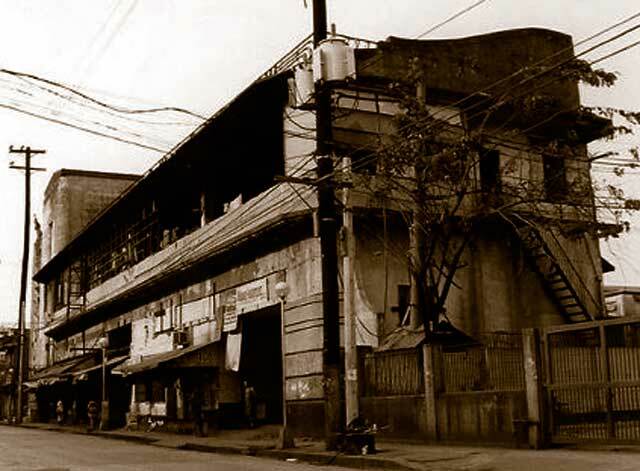 I can remember the old, small building in Cubao near MRT station (along EDSA). I believed it was the oldest building in Manila before it was decided to be pulverized. It was a real pity among the new generations that a part of the history that they should be learning are being torn down, one by one. I understand how you feel about it and I do agree with you that there a number of Chinese-Filipinos who help in the conservation of heritage like my friend Ivan ManDy and the wonderful group from Escolta. But if you list down the owners of all the works of National Artists and renowned architects in Metro Manila that have recently given way to parking lots or condominium buildings, you will understand what I mean. Maybe you could suggest how to make the Chinese-Filipino community more aware of the significance of their properties to the patrimony of the country. Here we go again. This but shows the helplessness of those who care for heritage. Businessmen do what they do. Heritage advocates should do the same in turn. Perhaps creative pro-active efforts for conservation can be introduced (by existing concerned institutions if by none else). As a start, a program that would tag imperiled structures in Manila could be done (or is this already done?). 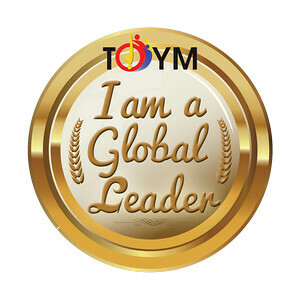 The corresponding next level of action would be to generate out-of-the-box solutions to the problem. In the case of the Meralco Bldg. for instance, couldn't Meralco have been tapped (nagged?) to help out the cause? All know that Meralco would have the resources to move out the shell of their old building (to their Ortigas compound) at the least if they wish. Perhaps it could be made operable as the facade of a special museum for Meralco. It's worth a try, don't you think? I hope this building could be saved. We should preserve these few remaing pre-war buildings which are part of our heritate. It is sad to know that another heritage building will be demolished. We have to admit that people are not aware on the cultural importance of these buildings, and thus, view these buildings as ordinary properties. Unless government could put some action on how to preserve these heritage buildings. I am saddened with the loss of a great artwork that should have been preserved for our next generation. However, sorry to tell but I was a bit disturbed on your views regarding the new owners demolishing the heritage buildings. I think the race of the new owner is not the issue here, rather the system in place. On how the previous owner have neglected the building resulting to its poor state, on new owner hastily demolishing the building, the lack of action from the local government to preserve heritage buildings, and lack determination of national government in implementing its laws. I do agree with the insights of leonmayo and perhaps,we could begin by educating the public on which buildings or its facade should we start preserving. Probably our history books should also mention the importance of these buildings. Frankly, I'm stunned that this has been allowed to happen! I had been looking forward to photographing it when I visited the Philippines later this year! RA10066 has been in force for a couple of years now but appears to be still virtually unknown. The architects should have known that this building was covered by the 50 year rule; presumably they have to undertake CPD (Continuing Professional Development) like other professionals? Additionally, I would assume that some form of permit would have to be obtained for the demolition and/or new construction works? Whoever has the responsibility for issuing this permit (the Manila City Engineer is mentioned is it him or her?) should surely be required to know about this law as it would be one of the legal reasons for not issuing a permit. Certainly, all those in such positions should now be made aware of RA10066 and of who to contact in order to gain heritage advice. Obviously, one of the reasons for such occurrences is that there isn’t a national list of buildings of heritage significance. In the UK they are actually called listed buildings! However, the nature of the 50 year rule means that such a list would constantly be falling out of date as additional structures fall within the age bracket. Further to that is the fact that compiling such lists takes years. The legislation to protect heritage buildings in the UK was first passed in 1947 and yet new buildings are constantly being added to the list as they come to peoples’ attention or their significance is understood. How much of the original building now remains? You mention that the art work remains which is vital. Your photograph at the start of the article dated 5th February also shows the frame of the facade. From photographs I have seen on the internet this is also important as the canopy had a ‘stylised eye motif’ which must be retained, along with the curved entrance way and statuette at ground floor level. Similarly the gate grill and high level metal work must be repaired and reinstated. A good architect will be able to both preserve what remains whist tying it into a new structure behind the restored facade although I’m sure we all agree this would have been better without any demolition at least until those parts of heritage significance could be identified. Reconstructing the current remains on a different site must always be as a very last resort. I sometimes deal with listed buildings, particularly railway stations, as part of my work and would like to see this former transport building given a happier future. The worry is that if this can happen in the centre of Manila and to a building whose importance was raised in the 2010 book ‘Art Deco in the Philippines’ then what is happening to those buildings in the other parts of Metro Manila and also in the Provinces. Best of luck in the future with both retaining this building and others like it. If I could help somehow I would like to! Quanta sofferenza provo nel vedere distruggere il patrimonio culturale di Manila! E' costato tanta fatica all'architetto e allo scultore. Chissà che ne penserà il nonno Francesco Riccardo Monti nell'al di là. I Filippini dovrebbero ribellarsi a tanto scempio. 1. What actually was it that stopped the demolition - was it upon the instruction by Mayor Lim, or was it upon the intervention by the HCS with the owners? 2. Does the MHHC play a role in reviewing demolition permits? What are generally the tasks of the MHHC? 1. It was the call of HCS chair Gemma Cruz-Araneta to Engr. Balagot that stopped it. GCA met with the owner on Monday and explained the value of building. They agreed to stop demolition. 2. No, MHHC is not tasked to review. Maybe with Mayor Lim's Executive Order, they will. What exactly are the tasks of the MHHC? What are the tasks of the MHHC? what is the significance of the said building in architecture, aesthetics, and urbanism, aside from being part of the past? In my several years at Adamson University and living at nearby Mercedes St. I could never imagine San Marcelino without the old Meralco Theater and Head Office. This is friggin' insane the rate they're tearing down pieces of Manila's glorious past. People without a history have no future.